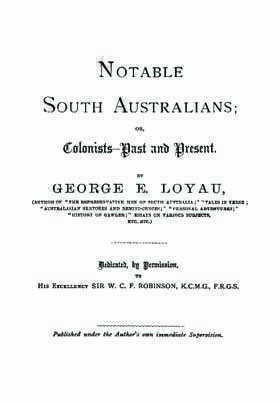 Published in 1885 by G. Loyau, this is the second of a pair of books containing brief biographies of great South Australian colonialists, written by George E. Loyau. Two hundred and eighty-seven biographies of founders and pioneers of South Australia are included in this book. They cover people in several different walks of life and range in length and detail. The book includes information on their early life, their career, their role in South Australia's development and their families as well as other relevant information. Some biographies are accompanied by portrait drawings. This book is useful for anyone interested in early South Australia and its most influential people. It's a rare genealogy tool that's perfect for anyone exploring their South Australian family history or building a family tree.